It wasn’t until recently I found out that this form of bed actually had a name, I simply called it, ‘a bed made out of branches and stuff.” Oops. 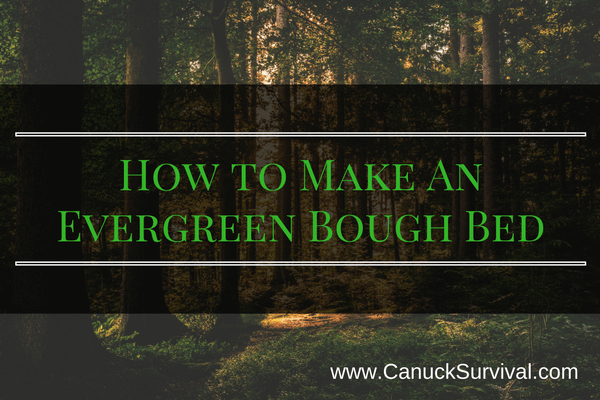 In this quick guide I’ll show you how to make an evergreen bough bed so you can sleep comfortably in the night and keep yourself elevated off the ground for warmth. What Is An Evergreen Bough Bed? A bough bed is critical in cold weather conditions to raise your body off the ground to ensure your body heat stays with you. Surviving in the winter is hard enough so make life easy learn how to make an evergreen bough bed. This DIY bed will work great on it’s own but for added comfort and protection don’t forget to pack a self-inflatable mattress like the one from the best survival kit items list. The bough bed became popular in the days of the fur traders in the northern U.S. and Canada. The bough bed consists of a frame made from logs, limbs, and saplings with a mattress of boughs and leaves. The bough bed is great because you don’t need any tools, although carrying a bow saw would definitely help. Start by gathering roughly three arm loads of needle-type branches and boughs. This all depends what’s available in your region so look for long, soft needles. Any other needle-bearing trees can work but keep in mind that sharp, square needles of spruce can be a pain. Don’t forget to pick out any pine cones unless you like sleeping with rocks in your back! Start building the frame by gathering 4 logs roughly 3 feet long then rolling over four logs (longer than you are tall) parallel to one another. Stack these logs as if you’re building a small log cabin like in the picture you see here. You could do with one layer however the higher off the ground you are the better. Use a jam knot to secure the corners. Use 2-3 sturdy limbs (1-2″ thick) as crossbeams for your bed. Don’t secure these so you have the ability to adjust later. Try to have one behind your knees and under your lower back for support. We have the frame so now for the bed. Try and find some saplings roughly 1/2″ thick to lay length-wise over your crossbeams. Flexible and springy is best. Once you have your “box spring” it’s time for the “mattress.” Take the boughs you gathered earlier and place them on your frame. Use a criss-cross or herringbone pattern to ensure your bed is covered evenly for maximum warmth and comfort. Dry leaves can be a nice addition if you can find them. Make the mattress as thick as you can. Keep adding arm loads of boughs if the mattress compresses too much or isn’t warm enough. Have you spent the night on an evergreen bow mattress? What would you do differently if done again? Leave a comment below!